Gig 'Em: $100,000 Will Let Texas A&M Fans Sleep In Hotel Across From Stadium : The Two-Way Football fans who pay for first dibs on rooms in a new luxury hotel get another perk: the money is tax deductible, as a gift to the school. Texas A&M is holding an auction and a lottery to determine who can stay at a new hotel that's being built across from the school's football stadium. Here, the facility is seen in an artist's rendering. Texas A&M University's football fans have a shot at staying just across the street from the school's stadium — but they'll need to plunk down $100,000 for the honor, provided they win a lottery this week. Another perk: The money is tax deductible, as a gift to the school. 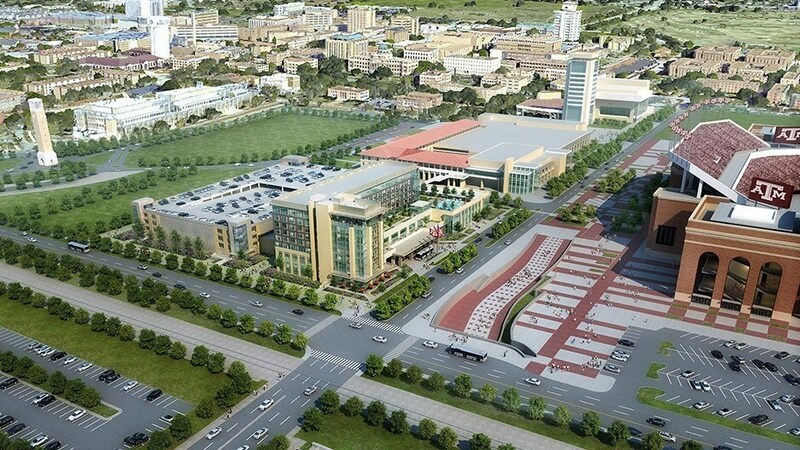 The Texas A&M Hotel and Conference Center isn't fully built yet. But for months now, the school has been calling for supporters to pay from $5,000 to $10,000 in deposits, to get a chance at a 10-year option to reserve one of the hotel's 250 rooms and suites. The rooms are being divvied out this week, a school spokesman says. Options for around 50 suites and penthouse spots are being auctioned off on Tuesday. Starting bids for the eighth-floor "Century Penthouse Suites" began at $475,000. Like the other room options, the money from successful bids would be considered a donation. "Guest Room Option donations are considered to be tax deductible gifts to Texas A&M University," the school says. "Please consult with your tax professional to understand the full extent of the deduction." Nearly 200 more guest rooms will be parceled out in a lottery on Thursday. If any rooms are left over, the options will be sold individually. The hotel is slated to open for the 2018 football season. Backers who win the lottery will be first in line to book rooms, as long as they plan at least 45 days in advance. And when they stay at the hotel, the price they pay will depend on whom the Aggies are playing — for non-conference games, the rate will be $299 a night, and for Southeastern Conference games, it'll be $399 a night. Located just 96 feet away from Kyle Field, the hotel will have a pool and 24-hour room service, along with a sports bar and a large convention center space. Limousine and car rental service will also be available. The lottery and auction represent an attempt to broaden the pool of would-be hotel customers beyond the university's top donors, a spokesman for A&M said. Proceeds from the hotel and conference center go to the university, the school spokesman said. Local newspaper The Eagle reports that the university is using a public-private partnership to fund the deal, working with a developer and a hospitality company. To make room for the hotel, Texas A&M razed Cain Hall — a facility that provided student services and whose removal in 2015 was criticized by some on campus. As the student newspaper The Battalion reports, opinions remain divided. "At the end of the day, education is a business," the newspaper quoted accounting sophomore Kimberly Morah saying, She added, "The university needs money to accommodate the 60,000 people that attend our campus. So if this hotel is able to assist in the funding of the university then this construction project was a wise choice." The Battalion spoke to civil engineering sophomore Tyra Patterson, who said construction could have been diverted elsewhere on campus. Patterson said, "This hotel holds no true educational value to this campus for the current students and should have been either further down the list of construction projects or never constructed at all."